It’s been a really nice November this year. I never imagined I would say that! It’s been unseasonable warm. What does that mean for Art Fairs? It means I don’t have to haul my dolly through freezing rain or snow. YAY! The weather is nice for shoppers- but they want to be outside…..Most of all it means I can still enjoy our yard and outdoor activities and the winter will seem shorter. This morning we had the first hard frost. In late October, I celebrated my 5th year at Oregon Fire and EMT Craft Fair. It’s in my town so it only takes 10 minutes to drive there. I had my usual spot and got set up right away. This is a well-attended show – even when the weather was beautiful. It’s really fun to see friends and neighbors at this event. My first show in November was at Hilldale Mall in Madison. The organizer, Colin Murray, is delightful to work with. My space was in front of a closed store that had a pretty gray-blue covering on the windows. It was a really nice backdrop. I introduced a new item at the Hilldale show. I now am offering a set of 6 different note cards with photos I have taken of the sunset over Lake Superior. So many shoppers have commented on my business card photo that I am offering them a chance to enjoy them more. Upcoming shows and more new items! I have a new helper at the beading table…. I will have a series of shows coming up- every weekend until mid-December. Check out my events page for more details. At each show I will be introducing new items. I have new ceramics pieces and glass vials to hold precious collections. I have added compasses and sand timers to my selections – Its about Time, its about Space. Its about time to leave this space. Hooray! It’s my favorite month of the year. The leaves are changing, the weather is cool and less humid and it’s the start of my busy show season. A Gathering of Rogues and Ruffians Renaissance Faire was a wonderful way to finish out the outdoor season. Set up was available on Friday and that gave me the opportunity to meet other vendors. The weather could not have been better and attendance was great. I was proud of the way my art fair tent transitioned into a renaissance pavilion. This was a two day event so I got to get out several renaissance garb sets. On Saturday, I dressed as a pirate. I was participating in the Pirate Quest where kids come to booths on a scavenger hunt to collect beads. The clue for mine was my pirate flag. Greg joined the fun on both days. The renaissance faire was followed up by my annual trip to Ontonagon in the Upper Peninsula of Michigan. We stay in a cabin on the shore of Lake Superior. I recommend these lodgings to anyone interested in the North Coast. Every night concludes with a beautiful sunset over the Porcupine Mountains to the west. Now that we have returned, I will be loading up my Ford Escape for indoor shows. The seats come back out, the Canopy is packed away until spring and the dolly cart will be loaded instead. My next show is in my home town- the Oregon Fire and EMT Craft Fair on Saturday October 22nd 9am-3pm at Oregon Middle School 601 Pleasant Oak Dr. This will be my 5th season doing the show and it is always well attended. This is the 22nd annual craft fair and all proceeds will be used for the enrichment of the Oregon Fire\EMS District volunteers through the purchase of equipment and training for the Firefighters and EMT’s. Hey- the 22nd show on October 22! I will be vending at a couple new shows for me this year. Watch for me in Hilldale Mall on November 5-6 Saturday 10 am- 9 pm & Sunday 11am-6pm and on Shop Small Saturday November 26th. This is my absolute favorite time of year. All summer I wait for the cool fall weather to begin. My show on September 11th in Monona started out at a brisk 59 degrees. How refreshing! Although it was only 4 hours long there is a popular Farmers Market there and attendance was great. What a lovely day and a fine show. Now that my September shows are done, I have a little break to prepare for the Renaissance Faire I will be selling at in New Glarus on October 8-9. Huzzah. Check out the home page to see a list of 2016 vendors including Carnelian Sol Designs and Betsy’s Beadworks! I will have new Pirate and Dragon themed jewelry and Betsy makes beautiful beaded cameos of Fairies and others. There are two Kids Quests – Pirate Quest and Fairy Quest that we will both be participating in. Here we are in the last month of summer and its 90 degrees out today; typical. We are just past Lamas, the festival of the first wheat harvest. Lammas is a “cross quarter” day occurring half way between the equinox and solstice; the “quarter days”. Others include Samhain- aka Halloween, Imbolc- aka Ground Hog Day and Beltane; aka Mayday. It’s interesting to me that our culture celebrates these holidays without the knowledge that they are rooted in medieval times. Many people are familiar with Lammas bread from the Lord of the Rings. It is the bread made from the first wheat harvest of the season and sustains Sam and Frodo for much of their journey. So August begins the last month of summer. For me, it means time to get busy for the upcoming show season. I have a couple really nice shows this month. Come see what’s new! Here is a sampling of new Pirates’ treasures necklaces and Bohemian Medley bracelets. I am excited to participate in the Art in the Mill Park art fair on August 13th in neighboring community of Paoli. It is from 10am- 5pm. There will be music, food and beverages all to be enjoyed in a shady park along the Sugar River. At the end of the month I will be in Middleton at their Good Neighbor Fest. It’s a two day art and craft fair on August 27-28 and is set in an oak savannah at Fireman’s Park. This is a large show with over 100 vendors. The annual fair offers music, food and beverages. Beginning with August shows, I will be bringing hand-dyed scarves to sell since we will be thinking about cooler weather coming. I cannot wait to roll out my new Shibori folded styles. Its mid-July and the summer is full on hot. This is the time of year that I do some textile dyeing instead of beading. I have been trying some new Shibori folding techniques this year. I have done many designs in the past with the “scrunch” method and securing the fabrics with rubber bands. Cotton scarf on a PVC tube. This scarf was dyed by my good friend Alice. This is me in my backyard where we do the rinsing steps. This white cotton fabric was accordion folded and pressed closed with plastic on the outsides to create the white spaces in a windowpane pattern. Below you can see all the beautiful colors on the line. The tee was tied and dyed by me and Alice for her grandson. Its the earth and sun. Last is Carol, Alice and me at the end of a dyeing day. These are the prototypes for more to come later this month. I am looking forward to debuting them at art fairs in August. I will be at Paoli Art at the Mill Park on August 13th and at Middleton Good Neighbor Fest on August 27-28. This month started out with a bang. 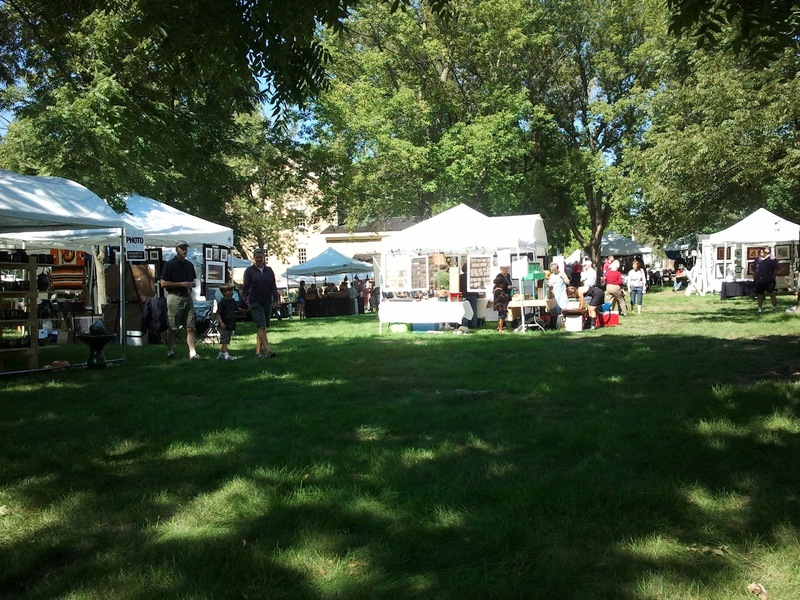 The Dragon Art Fair on Deforest was a fun and variable day. After a week of rainy predictions, it hardly rained on the event on Saturday. Attendance started out a little slowly due to sprinkles but blossomed in the afternoon when the sun came out. The necklaces below went to Deforest with me. A special shout out to my friend and business partner Betsy for inviting her sister Marge to visit from Mexico. She was a big help and had fun stories to entertain us all day. Now I am preparing for my next show at Hilldale Mall in Madison on June 18th. This is a new show is at a mall that I have shopped my whole life. The mall, built in the 1960s, has been remodeled and has many unique shopping opportunities including Art Fairs.